The moment when I walked into Magic Kingdom in Walt Disney World this summer a shiver went down my spine. There was an incredible feeling that this was somewhere I knew well but I was in a bit of an alternate universe. The layout was so familiar. City Hall was in the same place, there were turn of the 20th century style shops and buildings, Casey's Corner was still there on the corner, serving hot-dogs, but it was all a bit different. The Plaza I was used to in front of the Disneyland Paris castle was replaced by a larger space with fountains and statues of Disney characters in large gardens. We had arrived before park opening for our breakfast reservation at Be Our Guest and it was so exciting to take in the park whilst there were only a few other guests around. I had not been here in 22 years but I felt like I was home! 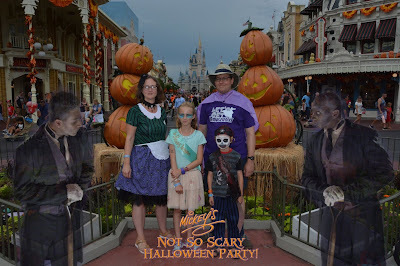 Having been frequent visitors to Disneyland Paris as a family we decided to go to Disney World this year as it was my 40th and it felt quite meaningful for me to return after 22 years and to celebrate my birthday whilst we were there. 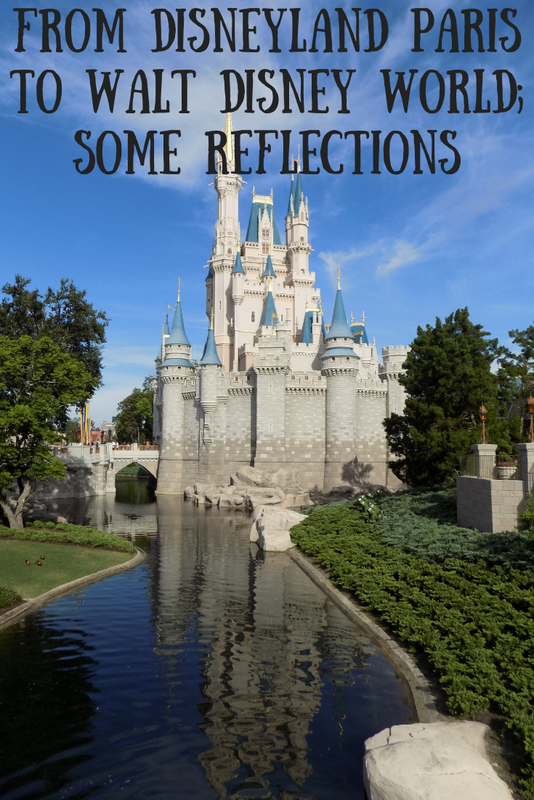 The prospect of a Florida holiday was incredibly exciting to us all and the kids were fully involved in the planning, there was nothing nicer than snuggling up in front of the fire on cold winter days to watch YouTube videos of the parks- it felt like an amazing new adventure. The kids are now 7 and 10 and are beginning to have the energy for longer days out and be more open to trying bigger rides and new experiences. I knew we were taking a chance with the heat of August but I feel it paid off. Yes it was very hot and in the middle to late afternoon there was often a storm but it only stopped or changed our plans a couple of times. The pay off seemed to be that the parks were quite a lot quieter than I expected. 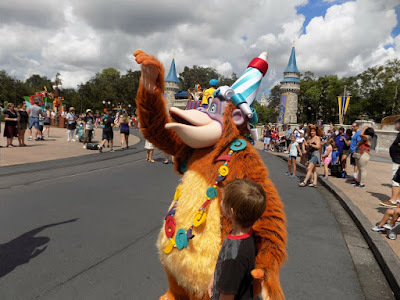 I especially felt this at Magic Kingdom on my birthday which was a hot Sunday 19th August, the Disney PhotoPass Day when I thought the park would feel much busier. I remember watching the daily parade feeling amazed to have lots of space around me! It was impossible not to compare my experience at times of Magic Kingdom and Disneyland Paris. The extra space and the many many more PhotoPass opportunities at Magic Kingdom meant that I didn't really feel the long queues and packed crowds I was used to in Paris which was surprising, I think I had prepared myself for the worst! It may have helped that many of the US schools were back in. The only night where it truly felt crowded was the Mickey's Not So Scary Halloween Party we attended where because everyone wanted to see the parade and watch the fireworks it did feel quite busy. We found queues for character meet and greets during our trip usually varied from around 15 to 35 minutes. We also really loved that there were a number of very relaxed opportunities to interact, hug and dance with characters. One of the main ones was the Move it! Shake it! Dance and Play it! Street Party which happened a few times each day. It was never very busy when we were there and so there was an opportunity to dance with any of the characters who were part of it. 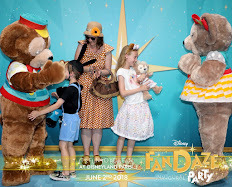 Disneyland Paris might benefit from more opportunities like this although I feel that the relaxed atmosphere I experienced during these interactions in Florida can seem missing in the formal meet and greets Paris. It might take a bit of a cultural shift but perhaps if there were more opportunities like these though in Paris then visitors would see that they don't have to just interact with characters through posed 'meet and greets' but in other more relaxed ways too. We stayed at Disney's Port Orleans French Quarter and had the free quick service dining plan which we upgraded to table service, this allowed us to try a wide variety of Disney World restaurants and snacks. Port Orleans French Quarter was a beautiful place to stay, I would recommend it to anyone. We were very lucky because I had faxed my room request a few days before, asking for ideally a corner room with two windows and not only did we get that but we got a garden view room in building three, just next door to the main building with the restaurant and all the other amenities. The resort is so small that it was easy to get to the pool, outdoor cinema events and evening camp fires. We flew into Miami on a British Airways 'fly-drive' which meant we had a car and could see a bit more of Florida and had more flexibility, some days we used the free Disney transport- buses, boats and the monorail, other days we used the car and some days a combination of both which was especially useful if we were booked to have a character breakfast at another hotel. It also meant that we could see some of the rest of Florida- driving past the Art Deco houses at South Beach in Miami and then visiting Disney's Vero Beach resort for lunch on our way to Orlando. On the way back to Miami we travelled inland and stopped at the Ah-Tah-Thi-Ki Museum on the Seminole Indian Reservation. If you asked the kids what they were looking forward to most from the holiday they would definitely mention the pool and these were definitely a highlight. They loved the pools both at the hotel and the sister hotel, Port Orleans Riverside. We also had two fantastic days at the two Disney water parks which definitely felt quite restful in contrast to the other Disney parks. Our holiday felt like a complete escape from everyday life for a couple of weeks- probably the best escapism I've ever experienced! We divided our time between the Disney parks- spending three and half days at Magic Kingdom, two days at each of Epcot and Animal Kingdom, one and a half days at Hollywood Studios. With the two days at the water parks this left us two days to do other attractions. On one day we went on a wildlife boat trip in the morning and did a trip to see the Disney-built town of Celebration followed by the WinterSummerland crazy golf in the afternoon. On the second of these days we made a trip to the Charles Hosmer Morse Museum in Winter Park which has the most comprehensive collection of Tiffany stained glass, this was beautiful and quite a contrast to the hustle and bustle of the theme parks. We then spent the afternoon at the Fantasia crazy golf before we did some packing and had our final dinner of the holiday at the 1920s themed Edison in Disney Springs. Our walk around the beautiful lake at Celebration. I am gradually now shaking off the jet-lag and returning to reality but I have the Disney blues really bad! As the kids loved the pools and water parks in Florida so much I feel that in the future we may visit more water parks in the UK and beyond. It would be fun to try the new Villages Nature complex during trips to Disneyland Paris. We are so lucky to have the Paris parks so close! There are so many exciting plans for the future of Disneyland Paris with the expansion of the Studio Park over the next few years. I feel there are things at Disney World which would be fantastic to incorporate into the Disneyland Paris park- the fantastic Sorcerers of the Magic Kingdom card game which was a highlight for my kids, I'll definitely be blogging more about this and the other games and trails we tried around the parks soon. 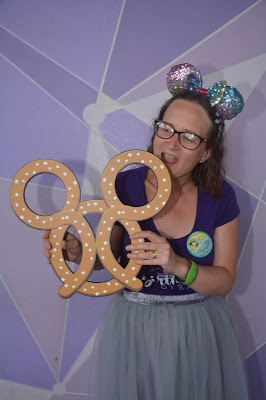 The Dining Plan at Disney World was a huge part of the experience for us- we tried a variety of different restaurants including eating in the castle at Cinderella's Royal Table for my birthday. A highlight for us was the very entertaining Hoop De Doo Dinner Show at Fort Wilderness where my son was chosen to take part. Paris could really make their dining plans so much more part of the experience by having exciting and varied snacks and drinks included like they are in Florida. It was fantastic to try the different treats- I loved trying the different ice-creams, drinks and slushies. Orange Dole float and Gaston's Brew were my favourites. Orange Dole Whip float at Sunshine Terrace- yum! Disneyland Paris has a beautiful castle which is truly for all visitors, unlike Disney World where parts of Cinderella's Castle are used at Cinderella's Royal Table restaurant and for the Bibbidi Bobbidi Boutique. In Paris everyone can enjoy a visit around the tapestries and sculptures telling the Sleeping Beauty story and go down to the dragons lair. Also, when it comes to rides, Paris has certainly learnt from the versions at other parks like Walt Disney World. I prefer Pirates of the Caribbean, Big Thunder Mountain and Small World in Paris and I love the beautiful steampunk elements of Paris' Space Mountain and Discoveryland. The one thing that my daughter loved in Disney World which we don't have so much of in Paris was the animatronics and history displayed in rides such as Carousel of Progress and Spaceship Earth. Both kids loved the Carousel of Progress which we did three times- just goes to show that the oldest attractions can still attract new and young adoring fans! Would I love to go back to Disney World? In a heartbeat! 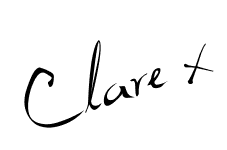 Will it happen anytime soon? I absolutely love travelling and seeing the world but I think these trips will be few and far between due partly to the financial costs involved in the holiday and the environmental impact of long haul flying. I would love to see Disneyland Paris become a bigger holiday destination and incorporate more of the fun we had in Florida. 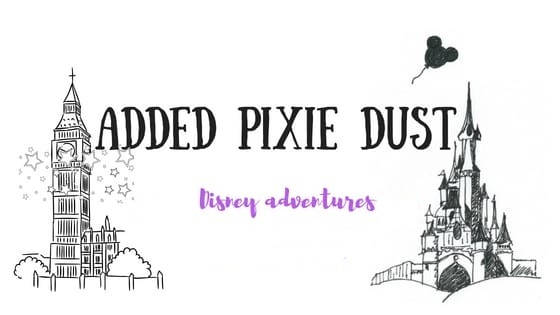 This autumn I will be blogging all about our trip to Disney World- apologies now! I'll be reflecting on the highs and the lows (mainly highs!) and hopefully this will allow me to relive what really has been the holiday of a lifetime. It might help others planning a trip to Walt Disney World- we have come home with lots of souvenirs including so many unforgettable memories! These are really cool images and I would love to explore Disneyland Paris. So, plan your holiday vacation with the gold crest holidays disneyland paris and explore the amazing destination. Wow!! Disneyland means lot of fun. 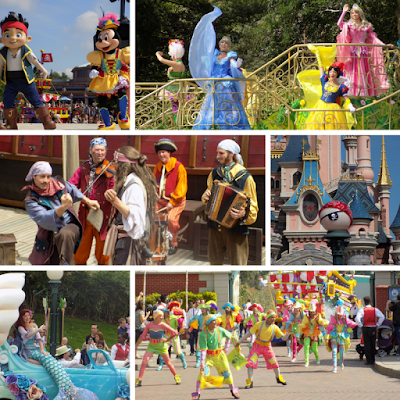 Get the proper Tips For Planning Your Trip To Disneyland Paris and explore the amazing trip in reasonable price. Oooh definitely interested in hearing more about the Sorcerers card game...?! Seems like you are enjoying trip to Paris. You love to explore the amazing destination. For staying at new destination you can book a vacation rental at Lahaina Vacation rentals which is the right destination for vacation rentals.